Yea!!!! 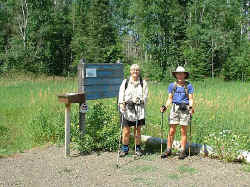 On 7/22 Adele and Judy finished the Superior Hiking Trail. This picture is at the northern trailhead. It's out in the middle of the woods almost at the Canadian border. The next segment of the North Country Trail is the Border Route Trail. It requires a several day overnight thru the wilderness. They will do it next year. They have completed over 900 miles this year. There were a couple of casualties on their hike. 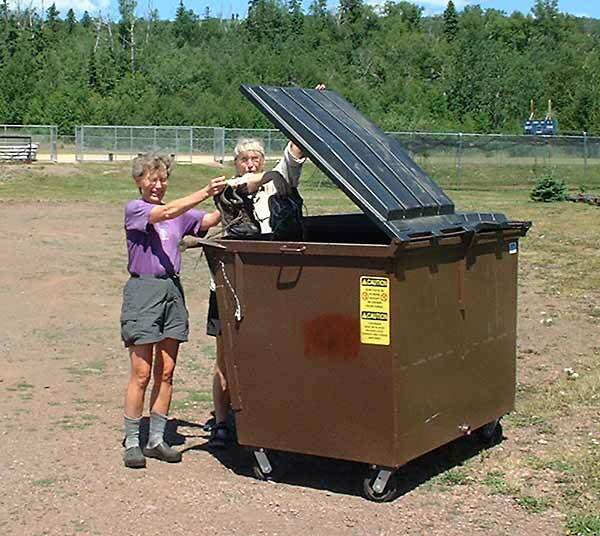 Their shoes went into the dumpster after the last day and Adele also lost her camera. Luckily I had copied all the pictures off the camera and made her a disk. Adele and John left the next day for Detroit and we moved to Ely, MN. 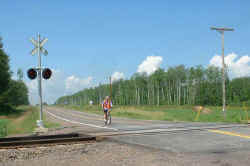 Judy wanted to bike the Mesabi Trail. 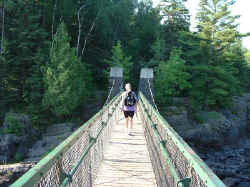 It's one of the sections of the North Country Trail. Located in northern Minnesota between the cities of Ely and Grand Rapids, the Mesabi Trail is a premier Minnesota bike trail winding through some of the state's prettiest regions. When completed, the trail will traverse 132 miles and connect more than 25 communities. Currently 97 miles of trail are complete. The rest is on roads. Judy bikes the road sections and I did some of the trail sections with her. 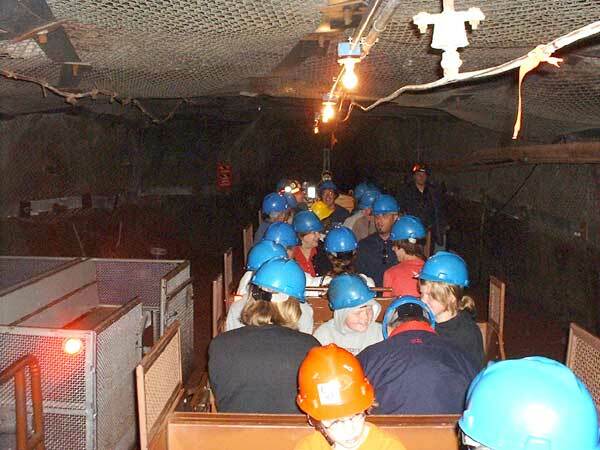 After biking one day we toured the Soudan Underground Mine. It's a high grade iron ore mine started in 1882. Mining stopped here in 1962 when it became cheaper to strip mine the lower grade taconite ore. It was then donated to the state. They run tours to the last mining area 2700' down. There is also a high energy physics laboratory run by the University of Minnesota down there. Judy didn't want to go but I went. The only way down is by this elevator. They jam about 8 people in at a time, ring a bell signaling the operator who is in a hoist building about 100 yard away and down you go, 2700' or 1/2 mile. It bangs it's way down at 10 mph along a track that is inclined at 10 degrees to match the layers of rock we are going through. At the bottom we get out into a cold tunnel (50 degrees) and load onto a train. 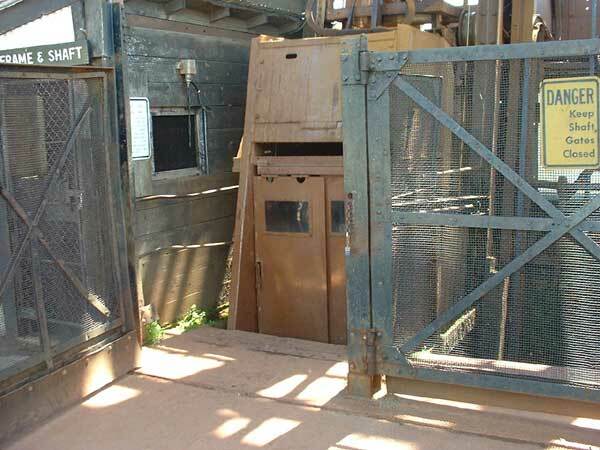 We then go 3/4 of a mile to a small room with a spiral stairs where we go up 25' into the mining chamber. We are actually under the ore vein and they remove the ore from the ceiling. The ore is then dumped into chutes that lead back down to the train. 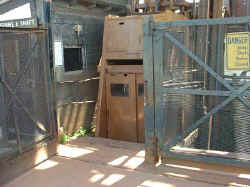 As they mine the waste rock is left on the floor raising the floor level. This room is about 250' x 500' and 30' high. They said there are rooms on other levels that were mined out that if the waste rock was removed you could fit the Astrodome into it. We also visited the "Root Beer" lady museum. 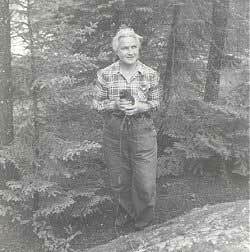 She lived on an island in the Boundary Waters over 40 miles from town for over 50 years. She made root beer and sold it to canoeists. She made 10,000-12,000 bottles per year. 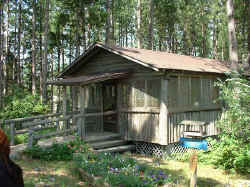 She died in 1986 and they moved her cabin to Ely. While we're talking about museums, we also visited the Minnesota Museum of Mining, next to our campground in Chisholm. The picture shows a 1930's dump truck with a capacity of 2 tons on the left. The big one is a 127 ton truck. The one's we will see in the mines are 240 tons. Chisholm is also the location of the Ironworld Discovery Center. 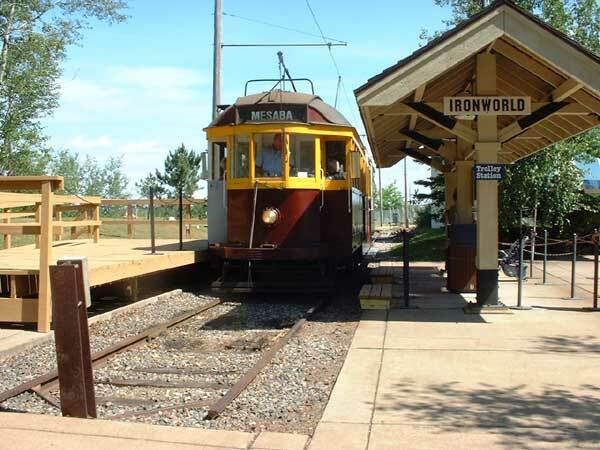 Ironworld Discovery Center, the largest museum complex on the Iron Range, is dedicated to collecting, preserving and interpreting the history of Minnesota's Iron Ranges. The largest ethnic in this area of Minnesota is Scandinavian. 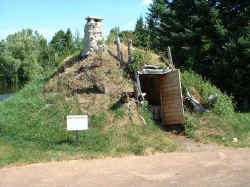 The picture is of a house used by the Sami's. They are natives who herd reindeer in the north of Finland. There is a lady inside who explained all about them. We also rode the trolley to an area where a mining community was located. There we toured houses and buildings typical of a mining town. 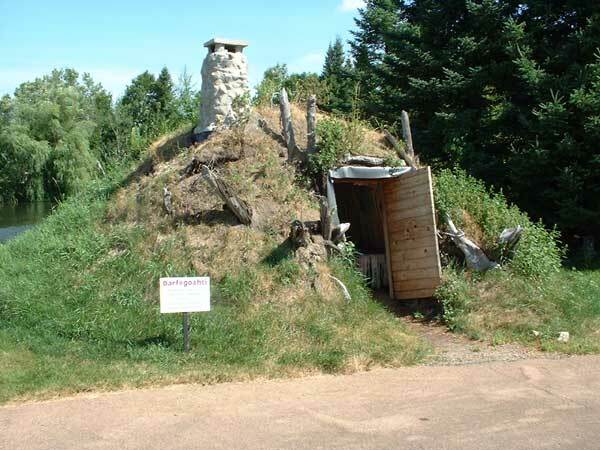 Hibbing, Minnesota has two claims to fame, the Hull Rust Mahoning Mine and the Greyhound Bus Museum. The Hull Rust Mahoning Mine is the biggest operating open pit iron ore mine in the world, more than three miles long, two miles wide and 535 feet deep. 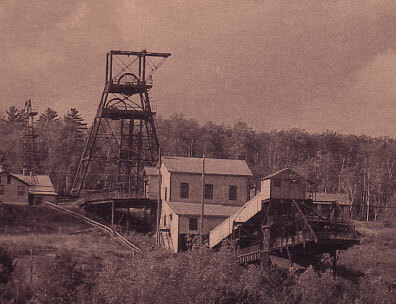 This man-made "Grand Canyon of the North" was the first strip mine on the Mesabi Iron Range. The amazing view continues to grow as the Hibbing Taconite Company Mine expands its mining operations. Rotary drills, 33-cubic-yard shovels and 240-ton production trucks can been seen in action at this National Historic Site. Click on the picture below for a larger panoramic view. At the bottom of the mine is a shovel loading the huge 240 ton trucks. Hibbing is also the birthplace of the bus industry in the U.S. It started in 1914 when the town was moved because it's old location was over the richest mining area. When a Hupmobile dealer couldn't sell his cars, he started a taxi service to carry people from one end of town to the other. He was so successful that he needed more seats and started by cutting the cars in half and "stretching" the to add more capacity. The next step was to convert truck chassis's to busses. The end result was the Greyhound Bus Lines, the largest bus company in the world. 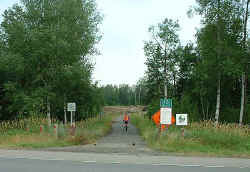 We finished biking the Mesabi Trail in Grand Rapids, MN. We were going to stay at the campground at the end of the trail at the fairgrounds but there was an antique car rally that weekend and it was overfull. 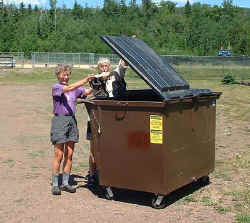 We ended up at a small city campground in Bovey, about 10 miles away. The scenery along the trail was unique. The picture below is of a mountain created from the waste rock from one of the mines. 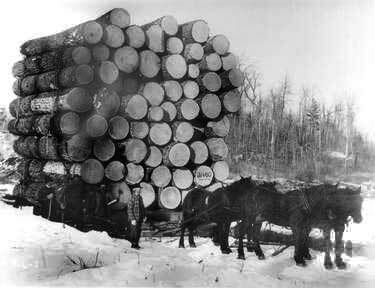 The other industry that has had a large impact on this region is logging. 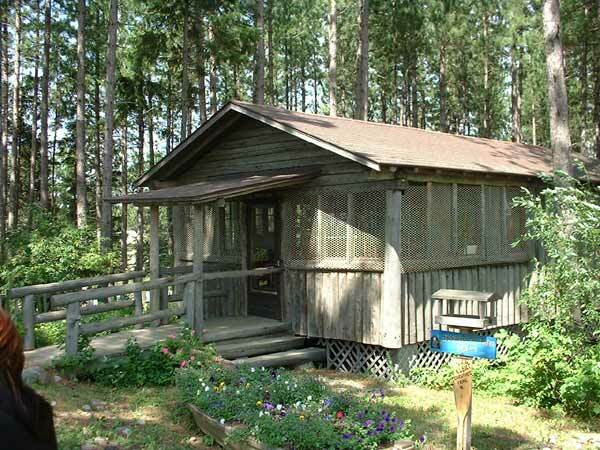 The Forest History Center has a turn of the century logging camp with interpreters to explain what it was like. While in Grand Rapids, I got a tooth ache and stopped at a local dental clinic. The dentist said I needed a root canal. He would do it but we would have to stay in town for a couple of weeks. Since we were planning to leave the next day, he gave me penicillin pills to clear the infection and gave me the x-rays so I could get it done later. 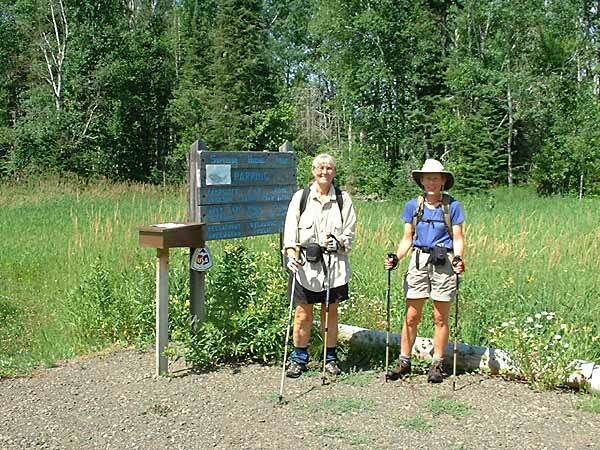 We moved back to Two Harbors so Judy could complete the trail section from there to the Wisconsin border. 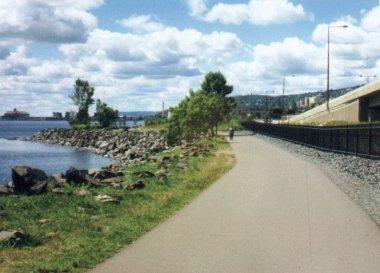 Judy biked from Two Harbors to Duluth on the scenic highway and then was on the lake walk, a multiuse trail along Lake Superior. 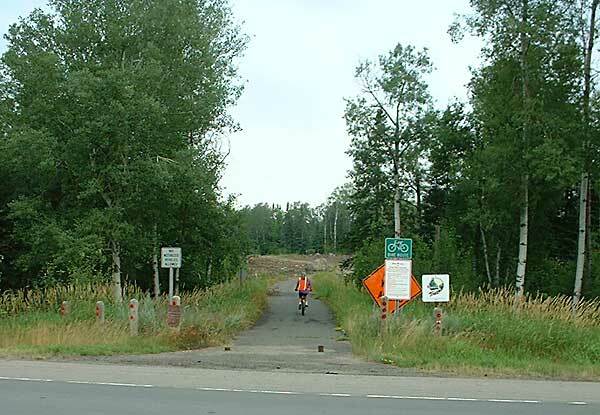 South of Duluth she biked the Munger Rail Trail to the Jay Cooke State Park. After a 5.5 mile hike through the park she got back on her bike for a 7 mile ride to the Wisconsin border. That ended our North Country adventure for this year. Our next stop was Cincinnati where I finally got my root canal (what fun!!). More to come in the next chapter.